You can do many things in ExLight. As a matter of fact you can do anything you can do in a “ordinary” Ubuntu/Debian system, but I suggest that you start doing this. A. 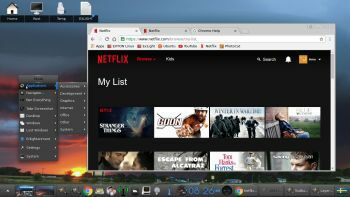 Watch Netflix movies in Google Chrome. You can do it as the ordinary user exlight or as root. B. 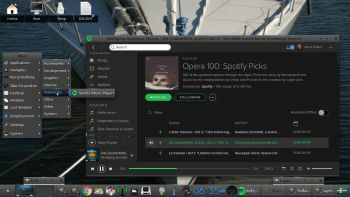 Listen to your favourite music in Spotify. 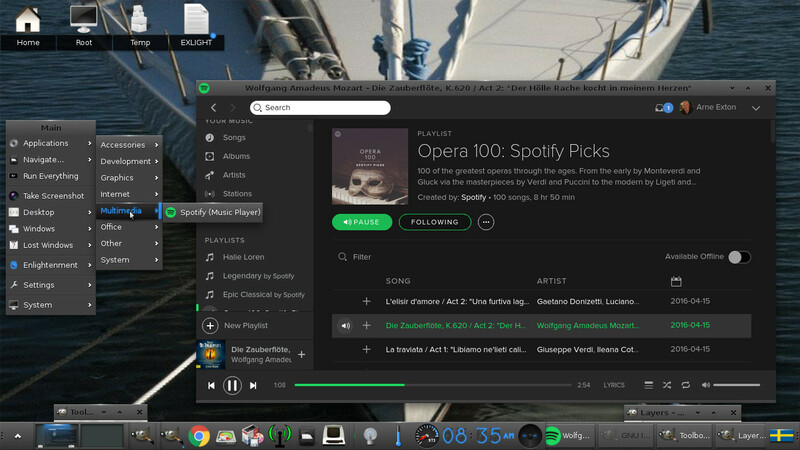 Install Spotify by running the command sudo apt-get install spotify-client. You can of course do it while running ExLight live (from DVD or a USB stick). C. Choose a real cool animated wallpaper. I have pre-installed seven very different animated wallpapers in ExLight. D. In ExLight Build 170105 I’ve added Refracta Snapshot, which make it possible for you to create your own live installable Ubuntu system. I mean change everything to your liking, fire up Refracta Snapshot and wait 3 – 5 min until your new ISO is ready! I’m trying ExLight 160810, live disk. Selected RAM in boot menu, and am delighted with the snappy response of the OS. I am, however, dismayed to find only three selections in the monitor resolution settings, which are poor, poorer, and poorest in terms of fit for this HP2010i monitor. However good the OS is overall, I am not willing to live with 1024 x 768 resolution, which is too far from appropriate for this wide screen monitor. Is there a remedy that provides a raster with appropriate proportions to produce a normal, undistorted image? Sorry, but I can’t remember the settings I use in other distributions that produce the correct fit. Which graphics card do you use? I burned ExLight 161016 to a dvd. The md5sum checks ok. The dvd boots, and seems to run ok.
… except that when I attempt to start Ubiquity to burn a usb, Ubiquity exits immediately, with a reported exit code of 1, and states that it will write nothing to a log, and that’s what it does; nothing. Started up, running in ram. Update seemed to work ok.
Upgrade seemed to work ok.
reinstall ubiquity seemed to work ok. Starting ubiquity produced a dialog box headed ‘Application Execution Error’. carrying pretty much the same message, nicely formatted. Attempts to copy that file to either of the usb drives already plugged in did not work. saying the that drive could not be mounted in the specified time. Nowhere did _I_ specify a time for mounting said drives. Both appeared as icons on the desktop, but did not mount or open when clicked. and an i7-5500U cpu with four cores at 2.4GHz. Have you done the installation like this? Note that you in advance (just in case) should create a partition of at least 10 GB for ExLight and a SWAP space double the size of your computer’s RAM. I.e. if you have RAM of 1024 MB or less. If you have RAM of 2 GB or more it’s enough with a SWAP space of 2 GB. The installation program in ExLight /Ubuntu is otherwise “intuitive”. Choose manual partitioning and select the partition you created in advance for installation. Or does Ubiquity crash immediately? Maybe I’ll have to do a test installation myself tomorrow. I have only done it in VirtualBox before. Ubiquity worked perfectly alright then. The hard drive is currently partitioned for Win7Pro and CentOS6.8, about 1Gb each. I have no immediate plans to install anything else to the hard drive. I am trying to install from the DVD to a USB directly, without using the hard drive. Ok, I see. I will try it myself later on today. Well, you are right. The problem seems to be computer/hardware related. On one computer I could almost finish the installation. On another Ubiquity crashed immediately. Now I have to make a new version of ExLight soon and replace Ubiquity with Refracta tools. Ubiquity is too complicated. Refracta tools (Refracta Installer and Refracta snapshot) work very well in ExTiX KDE, LFA (Linux for All), DebEX LXQt and Debian PIXEL. If you still want ExLight on a USB stick you can always use UNetbootin. Read about how to use it re. 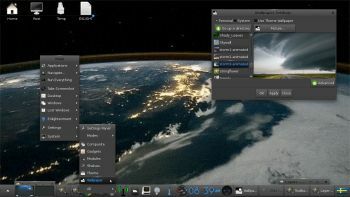 ExLight here: http://exlight.exton.net/?page_id=31 (under Alternatives in Windows).